Families from BFL’s Secret Garden and Freedom House domestic violence programs were the honored guests at an Easter event featuring a sumptuous luncheon, an Easter egg decorating station and a whole lot of sparkle. Spread The Sparkle, an organization whose mission is to “create events focused on celebrating family for individuals and kids who have no prior traditions”, treated 8 BFL families to a day of joy. 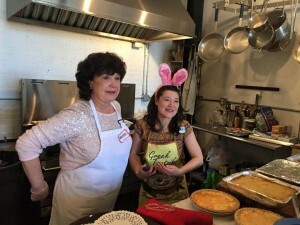 The luncheon, prepared by Valerie and Liana Rowe (pictured above) included baked ham, lasagna, quiche, roasted potatoes, pineapple souffle, green beans, carrots, potatoes and gluten free pasta as well as salad and chick pea salad. Theresa MacIntosh, founder of BFL’s Speakers Bureau and a member of the Freedom House Board of Directors, was on hand as a featured speaker. Attendees received a Polaroid picture to remember the event, along with a special gift bag.